I'll be the first to admit... I'm usually hesitant to spend more than $10 on nailpolish. However, I'm so glad I went over budget and tried something new. I've been eyeing Chanel's Longwear Nail Colour for quite some time and it's honestly so lovely & perfect. Not to mention, it displays beautifully in my bathroom and looks lovely when placed in my Insta photos. Priorities, am I right?! ;) But aside from the obvious benefits, this polish is truly at the top of it's game and worth the higher price point. 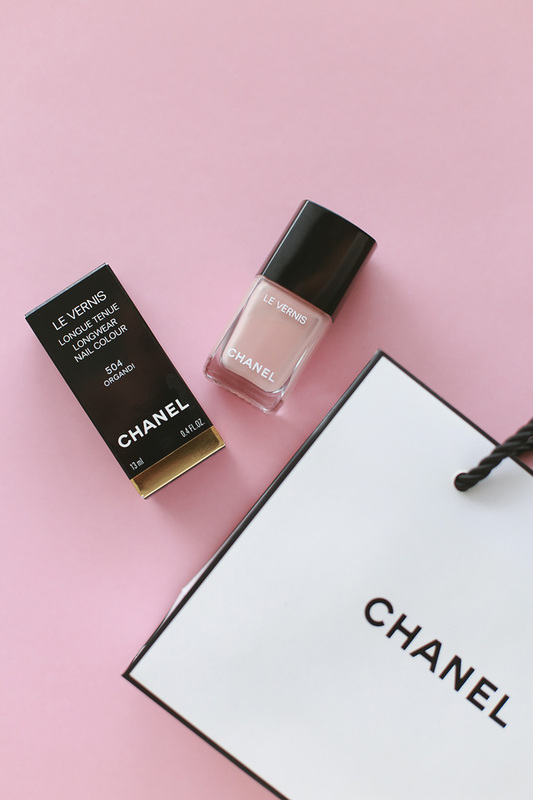 For starters, I was impressed to learn, Chanel's Longwear Nail Colour is 5-free, meaning it doesn't contain formaldehyde, dibutyl phthalate, toluene, camphor or formaldehyde resin. It also contains ceramides, which are lipids that help form a barrier, and bioceramics, which are strengtheners. And if you're wondering about staying power?... When used with Chanel's Le Gel top coat you can expect about 5-7 days wear. But for me, the biggest reward, has been my nail health. My nails have stopped pealing, yellowing (this was happening from poor quality nailpolish) and my nails are so much stronger too. I'm also a fan of the brush, pigmentation and formula consistency, all of which, help make the application process so much easier!